If you're looking for information about Christmas in London 2019, then you're visiting the right site. And don't forget to read our blog. Obviously London is an amazing place for Christmas shopping, but it's also home to amazing parties, great carol singing and all kinds of festive fun. 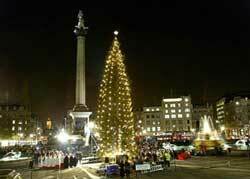 We know what to do in London at Christmas! The first broadcast royal speech on Christmas Day was from King George V in 1932. Originally only on the radio, today the message is broadcast on television, radio, and the internet by Her Majesty Queen Elizabeth II.